Amazon is continuously trying to remove any friction from online shopping activities. For examples, see how it pioneered quick one click purchases, introduced its smart home Dash Buttons, introduced barcode and image scanning for books, music and games, and taught it Alexa to help you with your shopping. 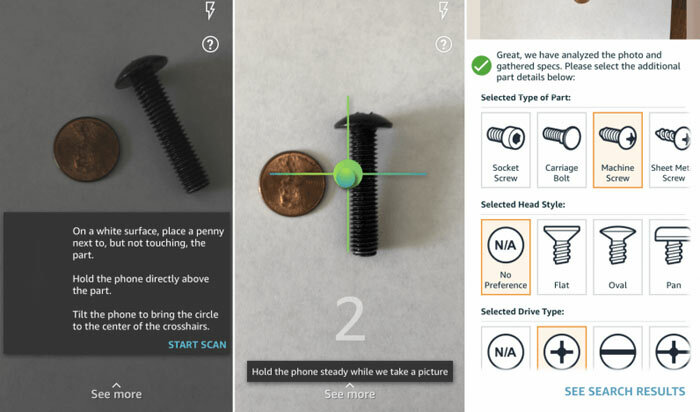 Amazon's latest trick to help you spend your cash is an extension to its mobile app functionality that identifies parts you might need in DIY tasks around the home. The added Amazon app functionality is suitably named 'Part Finder'. Part Finder specialises in helping you to search for screws, nuts, bolts, washers and other fasteners. For many products, size isn't an issue in Amazon's product recognition - if you point it at a keyboard or a mouse, for example, it will find similar suitable products. But for screws, nuts, bolts and similar, small differences in size can be crucially important. Amazon hasn't formally announced this new feature but confirmed to TechCrunch that it was rolled out to all (iOS) users just a couple of weeks ago. To use Part Finder you tap the camera icon in the search field and choose the function. You place the part you want more of on a piece of white paper next to a penny and position as instructed on the screen. Some crosshairs and a circle overlay help you get it right. If the initial capture is a success, Amazon asks you to narrow the results by fastener head type and style, drive type and so on - depending on what you have taken a picture of. 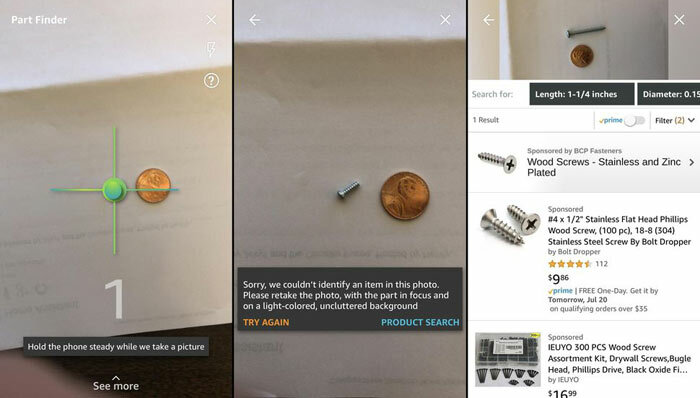 The new Amazon Shopping app extension uses computer vision technology and is said to be able to correctly identify "over 100 types of fasteners which represents thousands, if not millions of parts". Amazon acquired Partpic in 2016, and has only just started to use that firm's technology for its app. I've looked in my Amazon Shopping (Android) app but the camera functionality only covers product image search, barcode scanning, Amazon gift cards, and the Smilecode scanner. TechCrunch tested the app on iOS, and it could also be region specifi, for now. Not on my ios Amazon App. I guess for UK, they will need to use a UK coin for scaling purposes! Depending on how well it works, this could create jobs for mechanics and machinists, especially those specialising in extracting snapped metric bolts from imperial holes.